Can you believe that its almost Christmas! We finished our customer holiday orders and are looking forward to celebrating the holidays with our families - and a couple of days off wont hurt either! But not to worry, we'll be back at work very soon! We have to be, Valentine's Day is coming and before we know it we will be busily embroidering Easter baskets and dresses! But for now, let's just enjoy the holidays. We have had a truly wonderful year and our business really took off - we weren't always prepared, but we have had so much fun making things for our amazing customers - and we are going to keep on doing it! There is just something so wonderful about being a part of people's gift-giving. What will 2010 hold for the Preppy In Paradise crew? Possibly a new retail location? Perhaps! Some beautiful new products? Most definitely! We will continue to strive for creative perfection and customer service that is unparalleled! As usual, we invite comments, suggestions and yes, even constructive criticism! 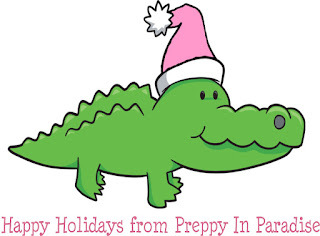 We wish everyone a very Merry Preppy Christmas and a Happy New Year!